After many editorials and features, there still seems to be much confusion about exactly where each Windows Phone will end up - officially. So I thought I'd produce an upgrade grid, for easy bookmarking. And note that I'm ignoring hacks like fiddling with phone registries - we're keeping things 100% legitimate here. There are several factors in whether a particular OS version/branch is pushed out to specific smartphones, with the principal one being not specs, but the age of the handset. Which makes sense in the commercial world, since this is the usual length of a phone contract and the minimum period for which vendors promise updates. Buts specs are a factor too (e.g. RAM), slong with manufacturer and willingness to support a phone. Looking at the official list of devices which will get the Creators Update (RS2) pushed to them, then adding in previous update availability, here's the situation for most Windows-running smartphones. I'll be accused of 'spinning' the situation somewhat here, but the abundance of green above shows that Microsoft hasn't done a terrible job of managing the various updates across the board. 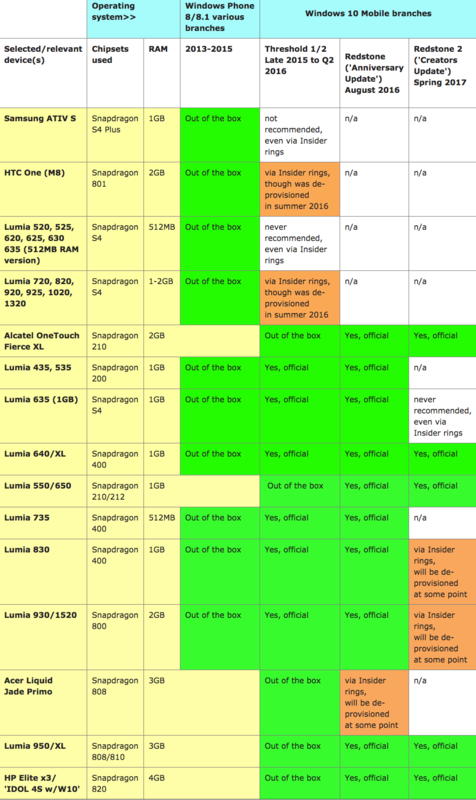 The orange 'Insiders only' boxes are the most controversial updates, of course, especially the recent ones for the Lumia 735 through to 1520, but as I've said before, here it's more todo with handset age and chipset. And we don't know how long Microsoft will keep these devices on their server provisioning lists for Redstone 2 (Creators Update) - although I suspect we're only talking about weeks, it could equally well be many months. We just don't know! Comments welcome - how does your device stable stack up on the grid and is its final resting place in terms of OS branch an issue for you? PS. As per my opening paragraph, it's possible to hack the Windows registry to make a phone pretend to be something it's not... I even tried this myself here - but it's not recommended, unless you're 100% sure you know what you're doing and you're prepared for some things not to work properly. Be warned.